Director Steven Spielberg's A.I. propels you into a future of astounding technology and adventure beyond the human imagination in an extraordinary film the New York Observer hails as a "masterpiece" and Rolling Stone applauds as "unmistakably the work of a real filmmaker." In a future world of runaway global warming and awe-inspiring scientific advances, humans share every aspect of their lives with sophisticated companion robots called Mechas. But when an advanced prototype robot child named David (Haley Joel Osment) is programmed to show unconditional love, his human family isn't prepared for the consequences. Suddenly, David is on his own in a strange and dangerous world. Befriended by a streetwise Mecha (Jude law), David embarks on a spectacular quest to discover the startling secret of his own identity. Celebrated as a film "filled with visual wonders and astonishing special effects..." (Roger Ebert & Roeper), A.I. 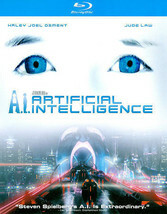 Artificial Intelligence is a visionary motion picture triumph!